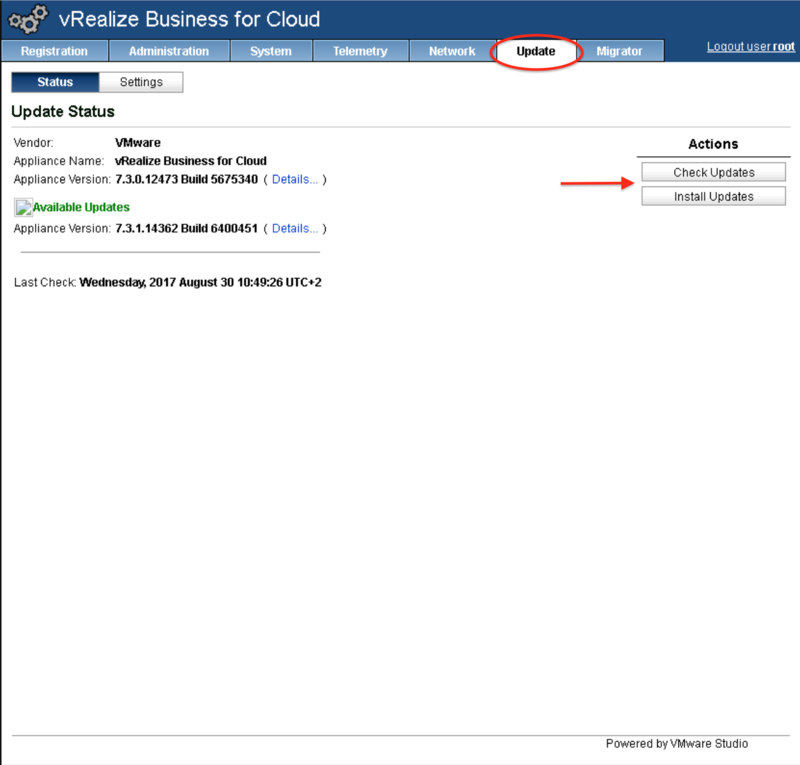 One of the many new cool features of VMware vRealize Business for Cloud 7.3 is report scheduling. 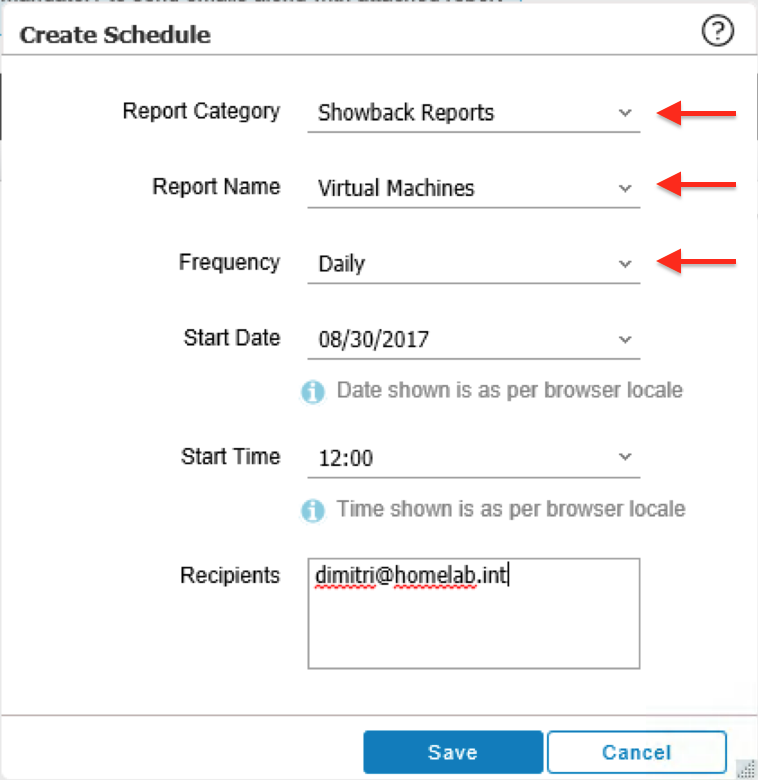 You can now schedule and email a custom report or the out-of-the-box reports to a set of recipients on daily, weekly or monthly basis. In this post I will show you how to setup the mail server configuration and how to add a scheduled report. 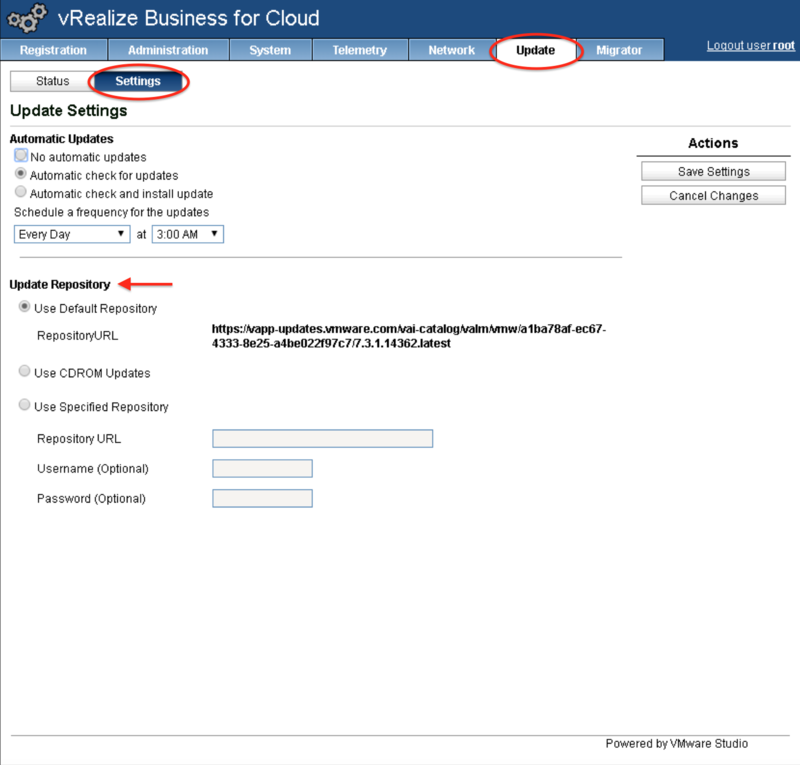 But first make sure to upgrade to the latest version of vRealize Business for Cloud 7.3.1 This release solves some critical issues in 7.3.0, one in particular, vCenter Server slows down or stops responding when it is added as an endpoint in vRealize Business. Besides resolved issues, 7.3.1 also adds some new functionality. 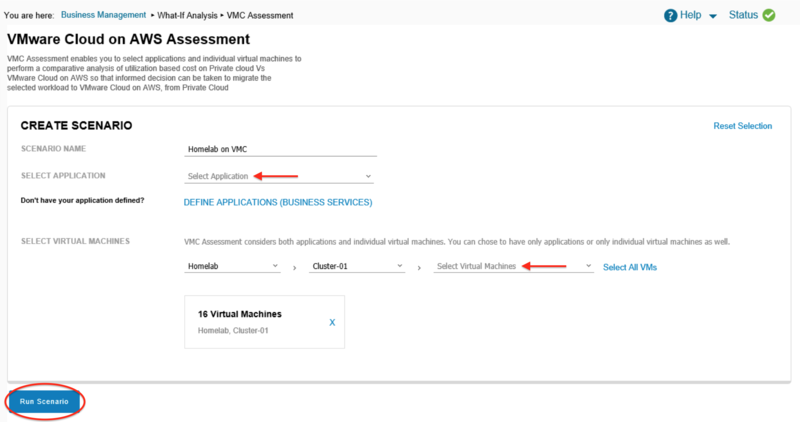 Some menu changes to provide enhanced and consistent user experience and a What-If Analysis for VMware Cloud on AWS Assessment. You can read the 7.3.1 release notes for more details. Updating vRealize Business for Cloud is a piece of cake. Go to your vRealize Business for Cloud appliance console and log in with your root account. Go to the the Update tab. There are three methods to apply updates, one is using the standard VMware repository on internet (default), using a local HTTP repository or downloading an ISO update file and attaching it to the vRealize Business for Cloud appliance. Be sure you have selected the right one by checking Settings, Update Repository. Save any changes. Go back to Status and click on Check Updates. When an update is available the console will show you. Click on Install Updates and click Ok. When the installation is finished, log back in your appliance console and check the Appliance Version. 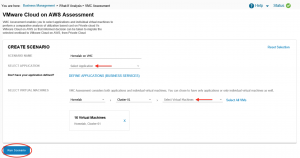 Before going further with report scheduling, I first want to show you the new VMware Cloud on AWS assessment. With VMC on AWS now being General Available (US only at this moment) this can help you decide to move your workloads to the cloud and build a true hybrid cloud. The report assesses the cost of running your applications and VM’s on VMware Cloud on AWS. Log in to the vRealize Business for Cloud console. Go to What-if Analysis, VMC Assessment. Give in a Scenario name and select your Application(s) and/or Virtual Machine(s). Click Run Scenario. 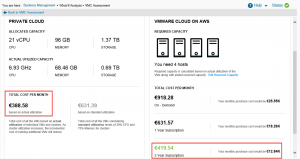 vRealize Business for Cloud calculates and displays the cost of running your applications and virtual machines on VMware Cloud on AWS with similar configurations in your private cloud. 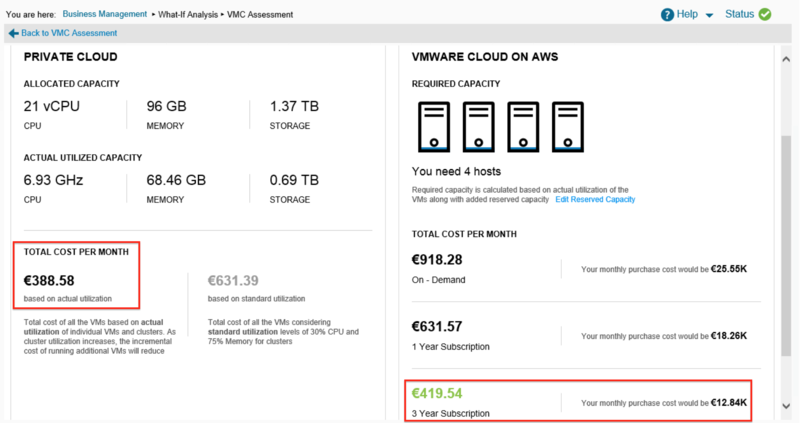 You can see the comparative cost based on the utilization for both your private cloud and VMware Cloud on AWS. The blue color in the servers is a representation of the utilization. 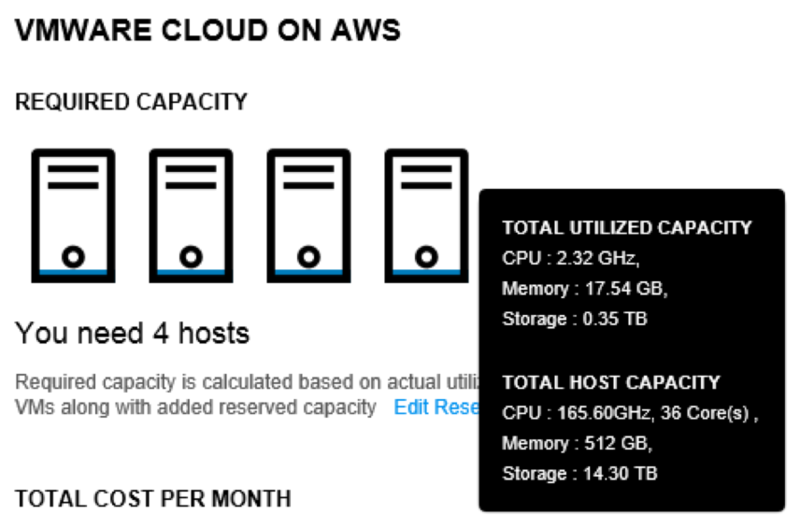 And if you hoover over one of the servers it shows you the available and utilized capacity details. You can also tweak an tune the pricing by editing Reserved Capacity and/or Discount percentage. 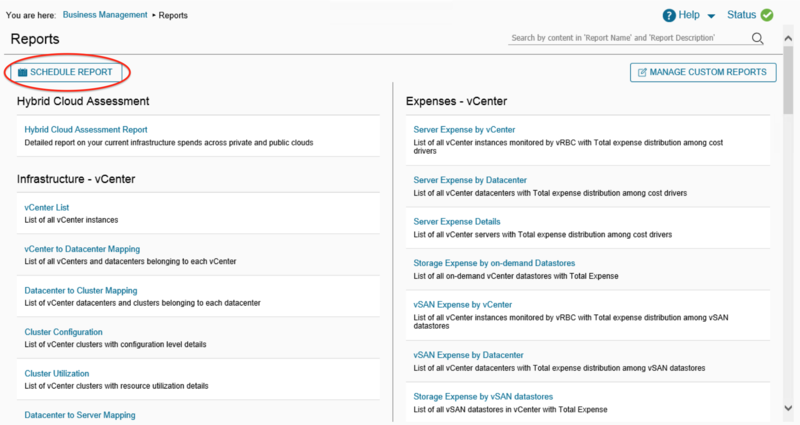 VMware vRealize Business for Cloud has some really nice out-of-the-box reports. 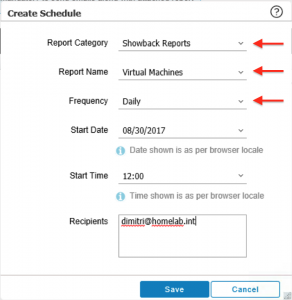 With version 7.3 you now have the ability to schedule a report to run and automatically send it to your management on a daily, weekly or monthly basis. 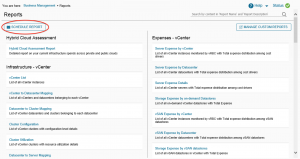 Log in to the vRealize Business for Cloud console and go to Reports. Click on Schedule Report. 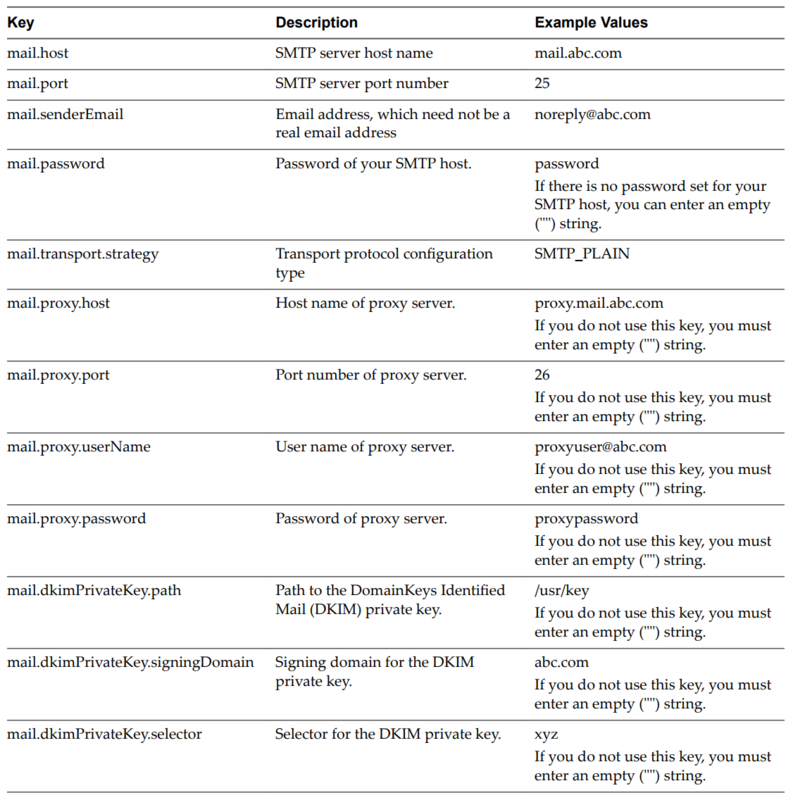 Notice the notification that SMTP server configuration is mandatory. We will do this later. First click on the + button to create a schedule. Select a Category, the report you want to schedule and a run frequency. Also select the Start Date and Start Time. And finally the email addresses of the persons to whom the report has to be send. 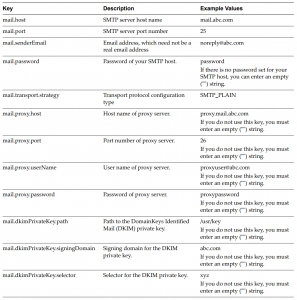 Next step is to configure the SMTP mail server configuration. For that you have to log in with SSH into the vRealize Business for Cloud appliance with your root account. 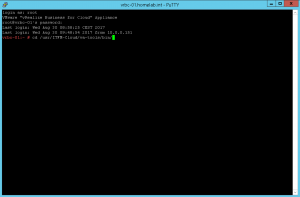 Navigate to the /usr/ITFM-Cloud/va-tools/bin/ directory. 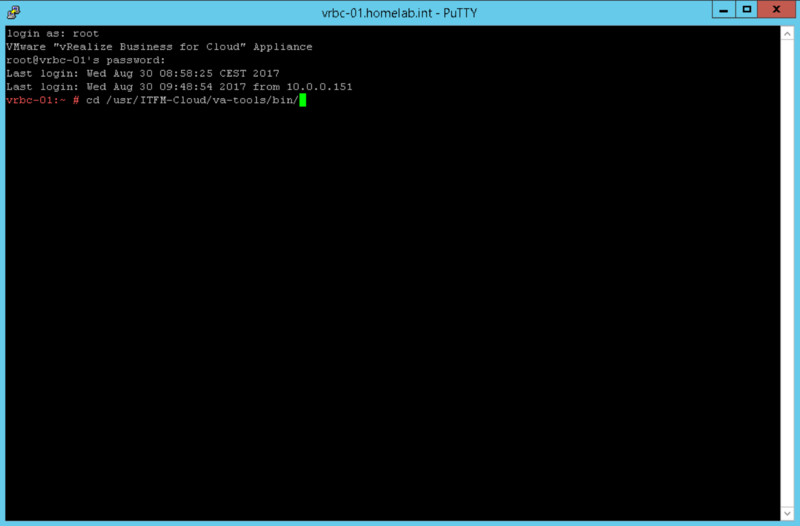 To configure your SMTP server properties, run the configclient.py SET -k -v command. You must configure all the parameters listed in the table below, even if they are not applicable to your environment. You must add “” for keys that you do not use in your environment. Run the monit restart vrbc-xenon-services command. 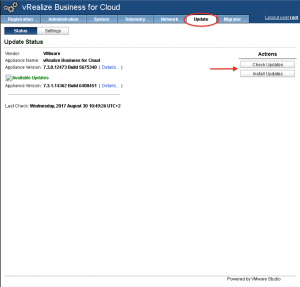 For the configuration to take effect restart the vRealize Business for Cloud appliance. 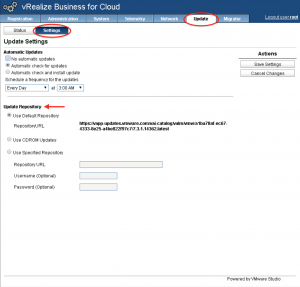 After the restart, log in back to your vRealize Business for Cloud console. Go to Reports and click on Schedule Report. Notice that the SMTP server configuration notification has disappeared. 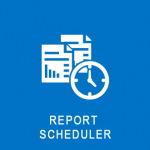 With report scheduling correctly setup, you will receive emails with reports in XLS format attached to it on a daily, weekly or monthly basis. Hello Dimitri, that was a very nice post! I have one question: i was able to configure the SMTP in vRBC but i am not receiving any e-mails. Is there a way to check at vRBC if the appliance is really sending the e-mails? Hi Priscilla, sorry for my late response. It gives the exact errors in /var/log/vrb/itfm-server/itfm-server.log for the failed e-mail sendoff. If you didn’t configure all the parameters (as well as a ‘monit restart vrbc-xenon-services) the log receives a generic “message not signed with DKIM” error message.